Weekend clean sweeps are very few and far between but Travis Millar, who knows all about winning in the 2017-18 Wingless Sprint season, did just that with a dominating the annual Gary Bowden Memorial Cup. This season’s event, which was held over two consecutive nights, began at Rosedale Speedway on Friday night and concluded at Bairnsdale Speedway on Saturday night, with the latter night doubling as the penultimate autObarn Super Series round. The Gary Bowden Memorial Cup, held annually after his untimely passing in 2014, is a race that is held in very high regard. Bowden was instrumental in the success of Wingless Sprints, not only in the Gippsland area of Victoria but also state-wide. In addition to being president of the class in Victoria, he was also a racer and well-respected member of the local community. After Bowden passed away suddenly in 2014, the Gary Bowden Memorial Cup was first held in the 2014-15 season. On the opening night of competition, Millar, who is current Victorian Champion, was too strong over the 25-lap distance defeating his veteran rivals in Tony Moule and Peter Logue. The top-10 finishers were rounded out by Chris Halesworth, Jason Andreatta, Wayne Logue, Luke Schneider, Brad Foster, Todd Hobson and Viv Rockliff. Drivers then converged on Bairnsdale Speedway the following night for the conclusion of the Gary Bowden Memorial Cup, which incorporated the penultimate round of the autObarn Super Series. The SS Auto Wholesale supported 50-lap feature race looked like it was going to run non-stop; however, a stoppage on lap 47 occurred. This stoppage was caused by Dayn Bentvelzen, who was running in third at the time, when he cut down a right-rear tyre, which left Travis Evans with nowhere to go and rode his right-rear wheel and crashing out in spectacular fashion. Both drivers emerged from the incident unscratched and were consequently out for the ensuing restart. At the restart with three laps remaining, Millar lined up out front ahead of current autObarn Super Series point standings leader Daniel Storer in second and Alex Thomson in third. As the green flag came out Millar used the lead to his full advantage and raced away to record his third win of the season. At the fall of the chequered flag, he defeated Storer and Thomson in second and third place respectively. Completing the top-10 finishers was Moule in fourth, followed by Matthew Symons, Luke Schneider, Todd Hobson, Chris Halesworth, Daryl Logue and Jason Andreatta. 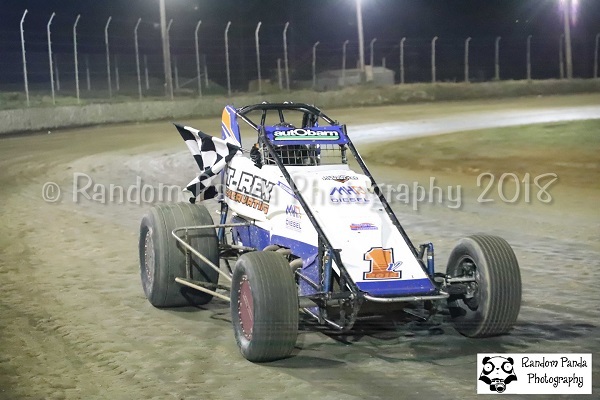 The next Victorian Wingless Sprints event is set to be the final autObarn Super Series at Simpson Speedway round this Saturday night (April 7), which is to run in conjunction with the annual Peter Merrett Trophy. For more information about the Victorian Wingless Sprints, visit their website at www.awsr.com.au/vic. You can also LIKE them on Facebook by searching Victorian AWSR Wingless Sprintcars.